A snake trap allows you to catch snakes and then release them unharmed. These are ideal products if you have a snake taking up residence in your backyard or wood pile or under a porch or out building where children or pets might get bitten. This is probably the best hands-off method of catching a snake because a good snake trap will shield you from any contact with the reptile, and then allow you to remove it without potential for injury. Trap the snake and then release it far away from your property. Please note that items shown on this page are not actually sold by SnakeProtection.com, but because many customers have asked about snake traps, so we have listed products below that you can purchase from Amazon. The unique combination of ingredients in this all-natural repellent irritate and confuse a snake's sense of taste and smell. When these senses are baffled, the snake is unable to gather information about its surrounding environment,so it will go elsewhere to survive. Timed-release biodegradable formula makes this repellent highly effective and long lasting. Comes in an easy to use shaker bottle. All natural - Napthalene Free. 2 lbs. 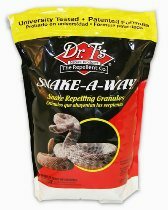 With greater than 91 percent repellency rate for rattlesnakes and garter snakes, Dr.T's Snake-A-Way is a powerful snake repellent solution that will help keep your property free of snakes. Snake-A-Way works by temporarily disrupting the viper's sensory receptors. This disorientation causes the snake to slither away unharmed, in search of fresh air. Not only is this America's No.1 Selling Snake Repellent, it is the only EPA-registered formula on the market, making it the best snake control option for homeowners. This product is safe when used on your property as directed. Fast-acting and easy to use -- wear gloves, apply the granules to the perimeter of the area that is to be protected. Place bands 4-5-Inch wide to repel garter snakes, 8-12-Inch wide to repel rattlers. 4 lbs. 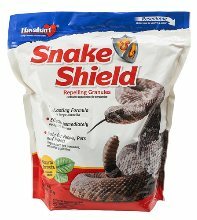 Snake Shield effectively repels snakes from areas around houses, cabins, garages, woodpiles, trash cans, flower beds and more. This product may also be used around the periphery of gardens. To apply, lightly sprinkle Havahart Snake Shield around or next to the area you want to protect in a band about 8 inches wide. This long lasting formula is effective immediately and is safe for use around people, pets, and plants. Active ingredients - sulfur, cedar oil, cinnamon oil, and clove oil 4 lbs. This is the small Cahaba Snake Trap. It measures 16 inches long by 5.5 inches wide and 2.5 inches high. Made of high density plastic that will last for years. Specially designed for small snakes up to one and a half feet. Comes complete with 3 glue pads. Snake Trap is a professional-grade capture and removal device. It was designed by a professional snake removal expert in Florida and has been field tested and refined over the years. Snake Trap works indoors and out, is safe to use around pets, and allows for safe relocation of unwanted reptiles. This trap lures in snakes by the scent on the dots as well as the internal design features that mimic the natural denning areas that snakes prefer. Once inside, they are incapacitated by the special biosafe adhesive inside the trap. The snake is alive and safe, but rendered immobile so you can release it far away from your property. 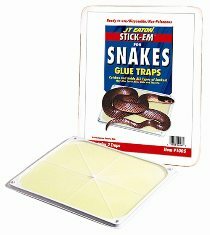 JT Eaton 100S Stick-Em Snake and Rat Size Peanut Butter Scented Glue Trap features an adhesive specifically developed to remain effective in a variety of temperatures, including cold areas. Stores under small enclosures and hard to reach areas to attract and catch snakes and larger rats and mice. Use this non-poisonous trap to eliminate pests without damaging your floors or breathing in toxic odor. This snake and rat glue trap uses an artificial peanut butter scent that is non-allergenic. Famous Stick-Em non-drying, non-flowing glue retains it superior holding power indefinitely for a no mess poison, control and disposal option. These traps are made of thicker plastic and are heavier than competing brands to resist chewing and escapes by larger aggressive rodents. Each corner has a hole so you can secure your trap in place with wire, nails or screws. Made in America, finished in white, 12.25 by 10.5 inches.